Finally some photos to share, but no definite name yet. So far he's being called: big lug, bigfoot, puppy, and other assorted non-names. 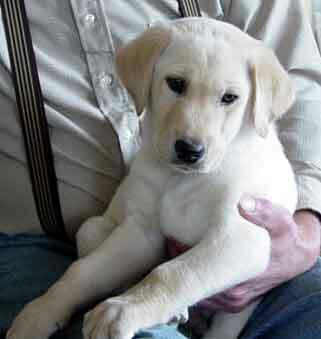 He's an amazingly calm Labrador Retriever puppy and it immediately felt like he'd been with us forever. Tucker stays a bit distant. Jeffie seems to want him to grow up and play. Lucy absolutely adores him. So do Gary and I.